Condensation occurs in a property when warm moisture laden air (steam) comes into contact with cold surfaces. As winter arrives, the problem often occurs. We constantly see pictures in the media of rental accommodation with black mould all over the tops of walls, particularly in the colder unheated rooms such as bedrooms and bathrooms. Invariably the finger is pointed at the “heartless” landlord who provides substandard accommodation for her long suffering tenants. It can of course be the case that with older properties wall and roof insulation are not up to modern standards, therefore heating bills are excessive, or it can be that heating system is inadequate or inefficient for the property, or there is insufficient means of ventilating steam at source: for example, in kitchens and bathrooms when cooking, cleaning, washing and drying. Two times out of three, when condensation becomes a problem in a rented property, it is the lifestyle of the tenants that is the cause. Tenants sometimes need to be educated to the causes of this and how to prevent it. Unfortunately for landlords, real understanding of the issue is sparse, even among the so called “experts”, so the finger is naturally pointed directly at them. If a tenant can’t afford to heat a property adequately, condensation is almost inevitable. Unfortunately there is no easy and quick way to deal with it. Anyone doing a clean up after it must take precautions as mould spores are injurious to health. Educate your tenant on ways they can prevent or minimise condensation. Make sure the building is adequately insulated – loft, cavity wall and wall lagging, where the walls are solid. All rental properties should have an EPC rating of E or above by law. Make sure the heating system is adequate and efficient to run. Make sure there is adequate ventilation particularly in kitchens and bathrooms; trickle vents on windows and automatic moisture sensitive fans if necessary. If its cold, tenants will sometimes block-up standard vents so check on these regularly. If all else fails, consider a full forced lofted installed heat exchange ventilation system which circulates warm air and removes moisture from the whole building. Landlords should be prepared to inspect their rentals regularly (a condition of most landlord insurance policies) and at the first signs of condensation mould they need to take action. First, to educate their tenants and secondly when necessary to consider changes as suggested above. 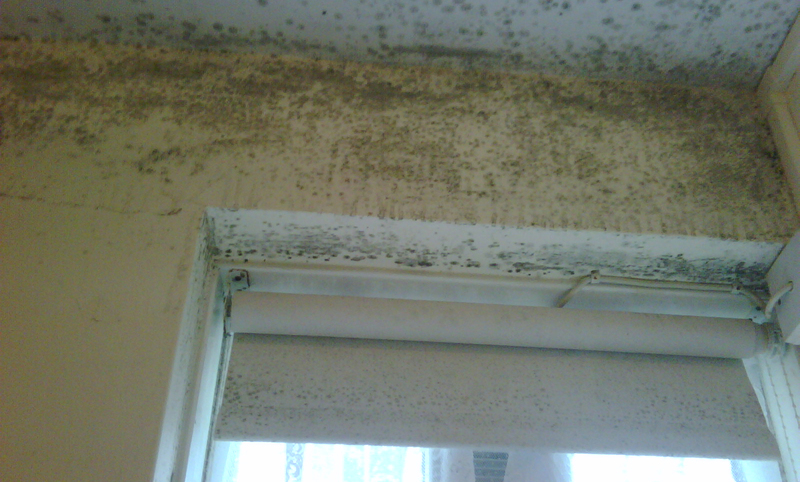 Condensation can often be confused with other forms or causes of damp by the inexperienced assessor. Rising damp or penetration damp exhibit different symptoms, but nevertheless landlords can often be blamed for a case of lifestyle generated condensation. This will often lead to misdiagnoses by, for example, inexperienced housing officers when tenants complain, and subsequent arguments in court if an eviction case ensues. If landlords do end up in court, they should preempt arguments over condensation by having their own expert report available for the judge to see – carried out by an experienced chartered surveyor. For example, having heating on constantly at a lower temperature is said to be better and more energy efficient overall that having it switching from high to off, which is what many tenants do when they are out at work all day; a bit of friendly advice here might help. With enough ventilation and fresh air you won’t see any condensation in your property.